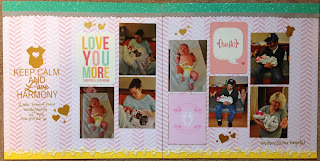 Today I have a 2 page baby girl layout to share. These are pics from Harmony when she was first born and had some visitors in the hospital. All of the gold (title, hearts & dots) around the page are gold vinyl. All cut with my Silhouette Cameo. The pocket page inserts are from a few different collections. I don't even know for sure which but I believe 2 of them are project life and the other one I'm not sure about. I cut the strips of paper (gray, mint, & yellow) with a paper trimmer and added some yellow baby ribbon across the yellow paper strip on the bottom. Lovely newborn layout! Adorable pics and great Gold embellishing! Thanks for playing along with the ScrapMuch?! Colour Challenge. Gorgeous! Love the gold rub on! Thanks for joining us at ScrapMuch?! Absolutely beautiful. Love the gold accents!! Thank you for sharing with us at ScrapMuch? Such an awesome and beautiful 2-page layout! I love how you used the Keep Calm theme here! So true!!! Thank you so much for joining us at Challenge YOUrself this month! Such a sweet 2 page spread - love all the touches you've added to complement those precious snapshots. Wow, you have rocked this challenge. I love the softness of these pages. Very sweet. Thanks for joining us at LCOM. Fab layout and great job with the colour challenge! So many wonderful elements to the page! Thanks for sharing with us at ScrapMuch? Thanks for playing along with Clique Kits! Oh, this is lovely. You are use many photos!! Thank you for joingin with us at Challenge YOURself! Adorable layout. Thanks for playing along with CK this month! These pages are really precious and sweet! Thanks for playing along with Clique Kits! I love the layout of this page. Beautiful job! Such a pretty page! Perfect title!!! Thank you for joining us at Challenge YOUrself. Super cute 2 page girly layout!! Love your "Keep Calm" quote!! Thanks so much for playing along with us at The Challenge YOUrself Blog!